The East Side Neighbors Association, or ESNA, was first established in 2010 when community members began to notice drug and money exchanges at Biddle Mission Park. The ESNA adopted Biddle Mission Park in 2010 with renovation plans to reduce crime and increase community use with support from many organizations around Carlisle including the Carlisle Sertoma Club and the Carlisle Parks and Recreation Department. The renovation plans were estimated to cost between $25,000 and $30,000 and included two new parking lots, a walking path, benches, new recreational equipment, and more. The Carlisle Borough Council approved the plans in February of 2010, and the Downtown Carlisle Association agreed to be the fiscal sponsor so that no tax dollars would be used. Biddle Mission Park received $19,000 in federal Community Development Block Grant, administered by the Cumberland County Redevelopment Authority, as well as construction materials donated by the borough of Carlisle to help finance the new additions to the park. 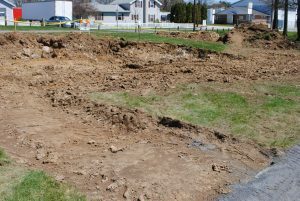 In conjunction with other organizations in Carlisle, the ESNA held fundraising events to raise the rest of the estimated costs for the renovation at Biddle Mission Park. The Carlisle Area Sertoma Club and ESNA hosted a joint yard sale and community day in June 2010 to fundraise and hold a groundbreaking ceremony for the renovation. Over 15 vendors attended the yard sale, and Giant Foods donated benches made of recycled material for the park as well as a $100 gift card to buy food for the fundraising events. 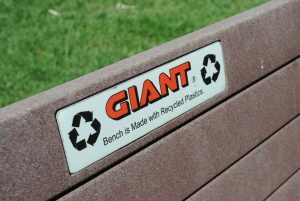 One of the benches donated by Giant Foods at Biddle Mission Park. The renovation project, named Park Access to Health (PATH), began in the spring of 2011 with the help of the Carlisle Public Works Department. Currently, Biddle Mission Park boasts a new walking path, updated playground, exercise stations, basketball court, and more. The ESNA and Carlisle Sertoma Club are working together again to install a labyrinth in Biddle Mission Park to provide a spiritual space for the Carlisle community as well; the labyrinth is expected to be fully constructed in spring 2017. Labyrinth construction at Biddle Mission Park as of early April 2017. The ESNA also works to keep downtown Carlisle safe. They specifically focus on the area of Carlisle that is east of Hanover Street. Their monthly meetings are held on the second Wednesday of every month in the basement of the Carlisle Alliance Church, located on 237 East North St.
Bosler Memorial Library’s “Read and Return Program” was created to increase access to reading materials to the Carlisle community. With support from other organizations such as the Carlisle Arts Learning Center and Cumberland County Housing and Redevelopment Authority, this program established Bosler Free Libraries. 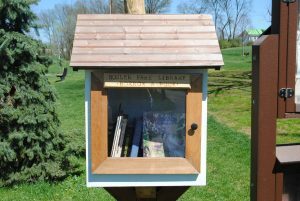 Bosler Free Libraries are small boxes located in many places around the Carlisle community such as Biddle Mission Park, Hope Station, and Butcher Tot Lot aiming to increase literacy and access to books. Citizens are free to take and return books at their leisure anytime. Bosler “Free” Library at Biddle Mission Park. All photos by Goeun Choi.